Daymark Solutions is a Microsoft Tier 1 Cloud Service Provider offering professional, managed and support services for Microsoft Office 365 and Azure. We are also part of the Microsoft Managed Partner Program - an elite group that represents the top 2% of Microsoft partners on the East Coast. Daymark holds five Silver Competencies including Datacenter and Cloud Platform. These competencies enable us to deliver the most robust cloud and hybrid solutions for customers of all sizes. 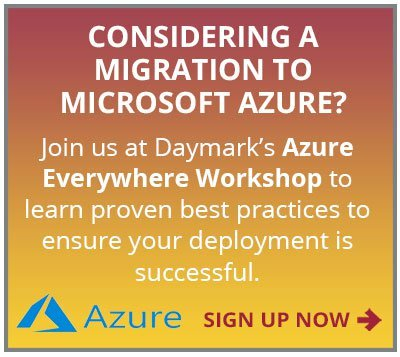 Learn the advantages of having Daymark as your Azure Cloud Service Provider. Microsoft Azure is a growing collection of integrated cloud services—analytics, computing, database, mobile, networking, storage, and web—for moving faster, achieving more, and saving money. With our two-day Azure Everywhere Workshop we can help your team jumpstart the adoption of a cloud platform with Microsoft Azure. In as little as one week your organization will have the ability to securely deploy resources on Azure enabling you to be more agile and responsive to business needs. Our extensive experience with virtualization, networking and security further strengthens our capabilities around cloud solution architecture and secure integration into enterprise data centers. Learn more about the Azure data protection and cloud security services we provide. Microsoft works very closely with Daymark to ensure that together we deliver outstanding solutions and services to our customers. In addition to design, deployment and on-going management of Azure, we can provide additional support to customers with proof of concepts, executive briefings and technical training at the Cambridge Microsoft Technology Center or at our corporate headquarters in Lexington, MA. Learn more about Microsoft Azure or ask your Daymark or Microsoft account executive how we can assist your organization with Microsoft Cloud Solutions. Are you ready for Azure? Contact us Today!